All I could think about while assembling this gratin is that I totally missed the boat on vegan Fourth of July options. I mean look at it! 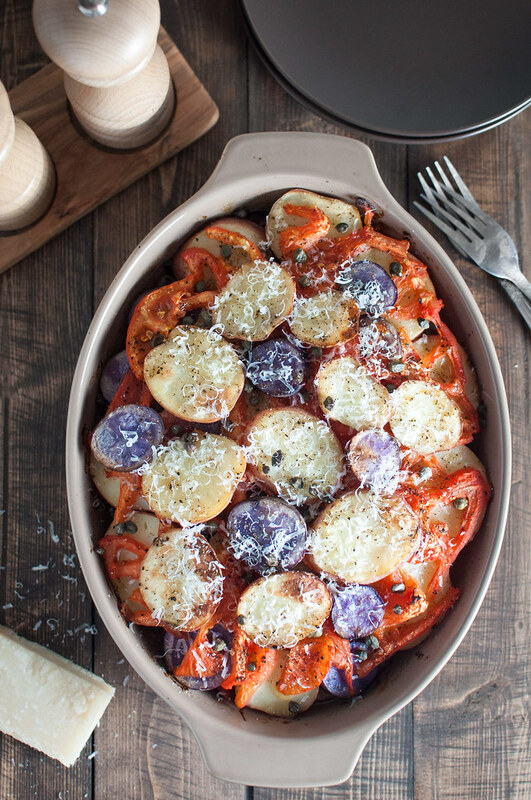 Is this not the most patriotic-looking potato gratin you’ve ever seen? 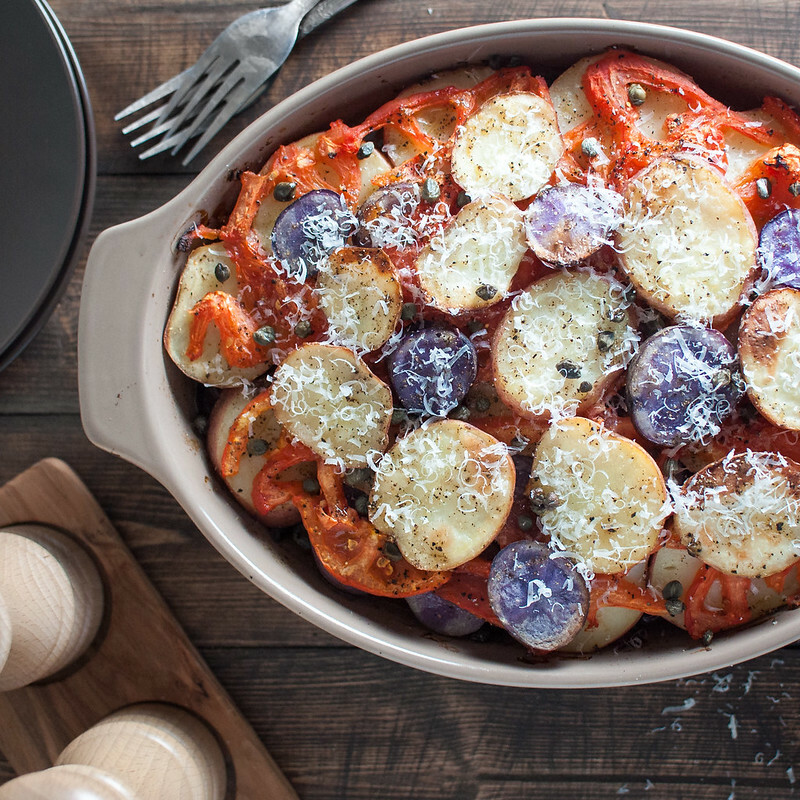 Red tomatoes, white and blue potatoes, and a few other easy key ingredients to add depth and salty pop. Literally, I did not even miss the cheese…maybe because it was right there sprinkled with parmesan. You get the idea, though. 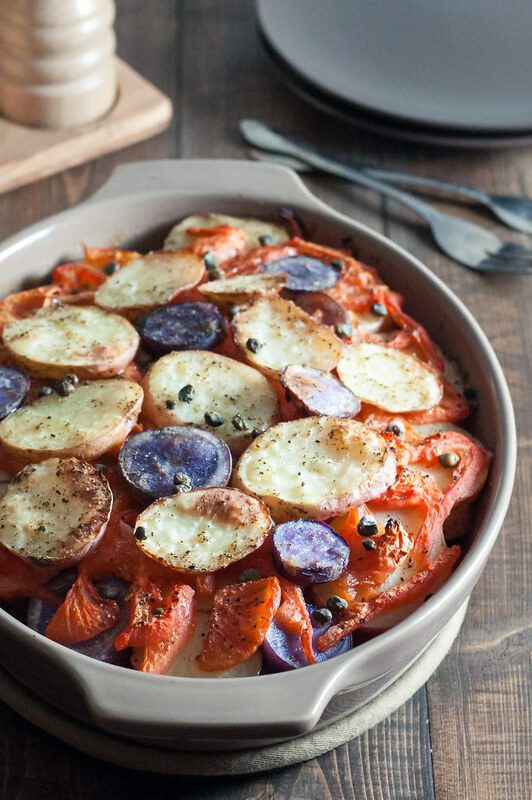 Whether or not you’re vegan, this tomato and olive potato gratin is a mighty tasty way to sneak a plant-based meal into your weekend. Don’t even worry about the belated color scheme, because I’m making up for being late on key holidays by being right on time for the best produce month of the year. August, with all its glorious tomatoes, corn, potatoes, summer squash, and ONIONS! These were the exact ingredients in my CSA share last Friday and on our dinner table last night. I didn’t grab a picture because I was way too concerned with the cheesy corn pile in front of me, but I think that dinner might have won most seasonal dinner of 2015: raw zucchini noodles with fresh tomato-basil sauce (thanks Kate!) and corn pudding (actually an upcoming gratin recipe) of super juicy sweet corn and the prize winning onions from this week’s trip to the farm. I’ve been eyeing those bad boys poking their tops out of the soil every Friday afternoon for the last three weeks, then I get the email: the onions are ready. The moment I’ve been waiting so hard for! Yes, we had some beautiful scallions, but not many cooking moments beat cutting into a big juicy onion with the green stem/top thing still attached. I was definitely just hanging out in the kitchen smelling that thing like a weirdo. Fun fact: contact lenses seem to protect from the tear-inducing effect of onion fumes. If you’re looking for some ideas for your late summer produce, you can still find them in my seasonal recipe index, but you might notice a couple things. One, I’ve been slacking on updating it. Two, I rearranged some things on the site. For the last three days, I’ve been mapping out all the content on NCK to try to help you find it better. When it comes down to it, this is not strictly a recipe website. Sure, that’s the meat (ummm) and potatoes of it at this point, but my goal isn’t just to crank out recipes that get pinned. If I were to sum it up formally, the purpose of this blog is really to help you eat balanced, homemade meals as often as possible, and to establish the importance of food as a key to health and happiness. Sounds a little cheesy, but I totally believe in the power of food, especially whole food prepared at home. Whether you’re someone who’s kind of meh about cooking or loves the kitchen as much as I do, I want to do everything I can to get you in there and feel like you accomplished something, be it homemade dinner during a busy week or an adventurous new recipe. With that in mind, I’ve hopefully given NCK a framework to house more resources in the future, as fast as I can write them. Just as soon as I get this wedding planning locked down, expect a new routine of weekly meatless meal plans(!) and home cooked menus for your special occasions. Woo hoo! Everything you would want quick access to–recipes, meal plans, and homemade menu plans–are right up in that top bar, under the logo. I know you know how to use a website, but just to make sure. It can be frustrating when your regular blogs do a website makeover and suddenly everything you know and love is in weird places. You can also find more info about me, Tessa, much more easily under “about”, plus get in touch with me via the contact link or even read up on my personal chef offerings if you’re located nearby, nearby being Fairfield County, Connecticut. This isn’t all, and, like I said, I’ll be rolling out detailed meal plans and better recipe lists just as fast as possible. Down at the very bottom of the page there’s a new menu with links to resources that I update when I feel like it, without as much frequency: restaurant reviews, posts about nutrition, cooking technique how-to’s, etc. And, as of right now, over in the sidebar there is a mess of lists that I need to clean up. Pardon my appearance while we’re renovating, as they say. It will all be worth it! If you have feedback, I’d love to hear it, especially if you were familiar with the previous navigation. 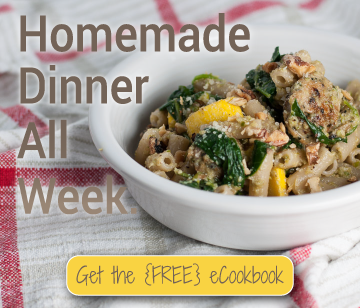 You can sign up for my weekly email so you don’t forget to check back, plus I have a free eCookbook with a one week meal plan to send you if you sign up. If you find the weekly updates annoying, you can unsubscribe and the book is yours to keep. Unfortunately/fortunately I’m a few gratin recipes ahead on testing and photography, so the corn pudding is not next up on the agenda at the moment. However, if we’re cutting it close, I’ll swap things around and be sure to post it while corn is still abundant! Bring a large pot of water to boil over high heat. Meanwhile, slice the unpeeled potatoes ⅜" thick (just over ¼" - fairly thick) and pierce the skin of each tomato in a few places. When water boils, add a generous pinch of salt, let it return to a boil, then add potato slices (work in batches if they don't all fit). Cook for 5 minutes, even if water doesn't return to a boil. Use a slotted spoon to remove to a colander set over a dish towel, then rinse with cold water and set aside. Submerge whole tomatoes in the boiling water for 30 seconds, until the skin just wrinkles. Remove to a cutting board and peel immediately by hand--the skin should slip off easily. Heat 2 tablespoons oil in a 10 to 12 inch cast iron or oven safe skillet over medium high. Add onions, dried thyme, fennel, and a dash of pepper. Stir often for about 6 minutes, until onions have just browned. Turn off heat and distribute onions in an even layer. If you don't want to build the gratin in the skillet, transfer onions to a 2 qt. lightly oiled baking dish. Seed and chop 1 tomato and sprinkle over the onions. Halve, seed, and slice remaining tomatoes crosswise. Sprinkle olives, half the garlic, 4 thyme sprigs, and half the lemon slices over chopped tomatoes. Make a single layer of slightly overlapping potatoes and sprinkle with salt and pepper. Top potatoes with half the tomato slices, followed by the rest of the garlic, thyme, lemon, and more salt and pepper. Make another layer of potatoes, followed by seasoning and the remaining tomato slices. If there are more potatoes (I had some), arrange over the top and season. Top with capers and drizzle the whole dish with 1½ tablespoons olive oil, then cover with foil and bake 25 minutes. Uncover and bake in the upper third of the oven another 30 minutes, or until the potatoes are completely tender (easily pierced with a paring knife). If desired, broil the uncovered dish for a few minutes to brown the top layer but watch that the capers don't dry out. Top with parmesan cheese and/or a spoonful of sour cream to serve (if not making it vegan), and spoon the broth from the pan over each serving. Use bread to soak up any extra sweet onion and tomato broth! 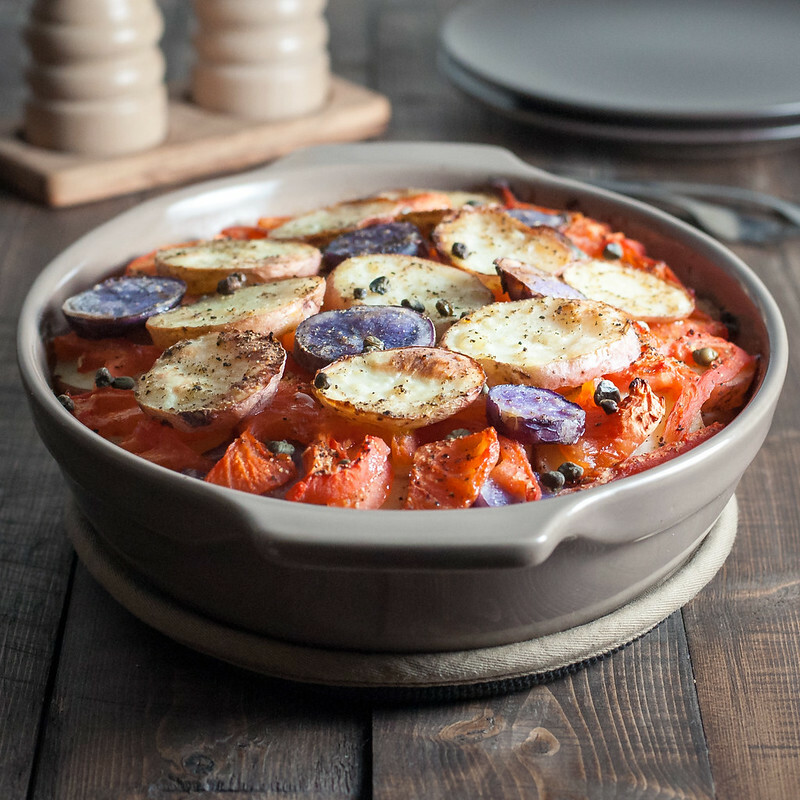 As written, without optional ingredients, the gratin is gluten-free and vegan. Note: This page contains affiliate links. It does NOT contain sponsored content. 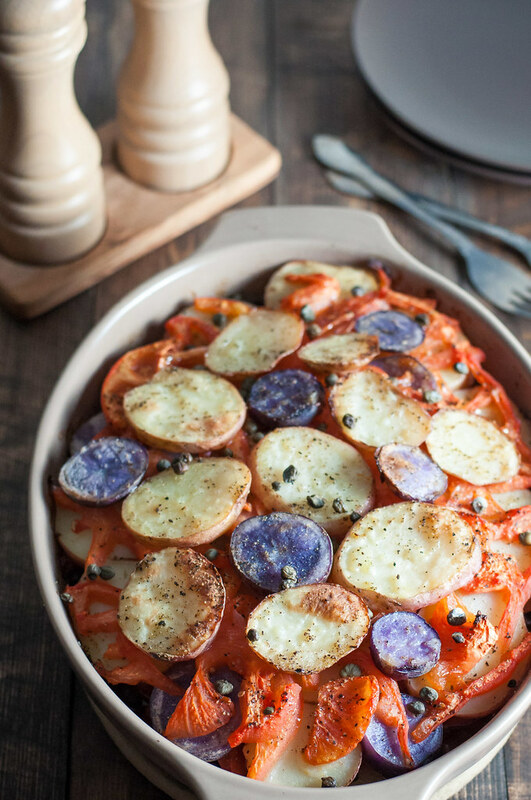 Affiliate links (to products I recommend, on Amazon) offset my ingredient and website maintenance costs, so I can keep bringing you gratin recipes like this one. Thanks! 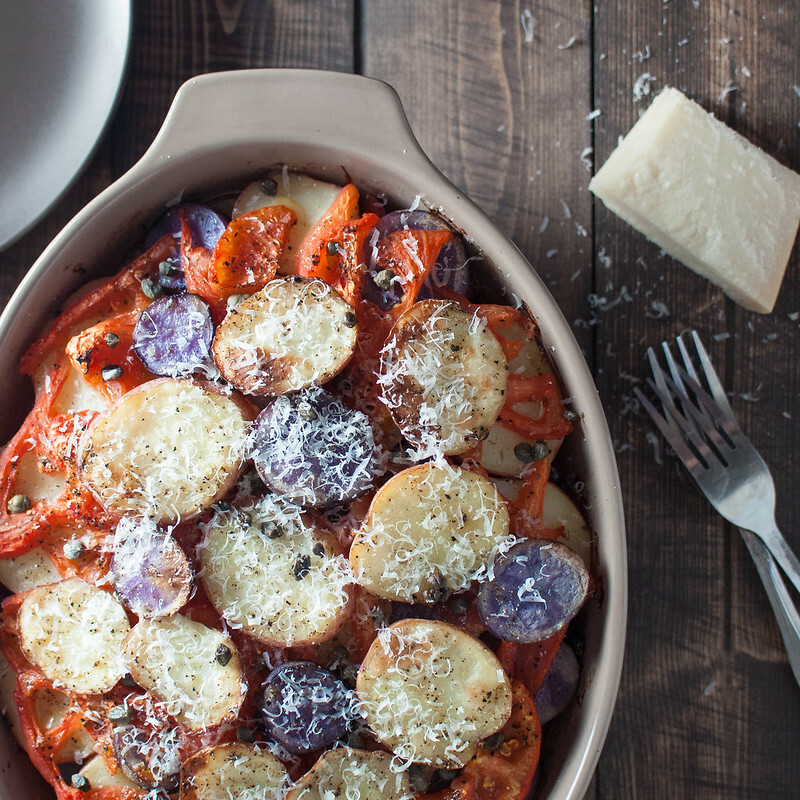 I am so making a gratin tonight.. this looks so comforting, warming and homely. Just what I need!